Gretchen Rubin takes another look at happiness, after her 2009 book, The Happiness Project. When her younger daughter starts kindergarten, Gretchen decides to take the next nine months to focus on happiness within the home and family. She describes herself quite frankly: how she’s trying to use her “mean face” less often to her family, how a perfect day is one spent at home, that she doesn’t like to make phone calls, and dreads driving (not so surprising as she lives in New York City). Older daughter Eliza and Gretchen go on Wednesday afternoon adventures together, often to museums. Gretchen collaborates on a children’s book project with her sister, finally deals with the backlog of family photos, and asks her family to knock on her office door so she can greet them more pleasantly. I like her suggestions to keep clearing clutter, focus on your family’s happiness, be yourself, and how spending fifteen minutes a day on something you’d rather put off can actually make you happier. I enjoyed her explorations of good scents, having a miniature landscape created for the family, and how she practiced under-reacting to problems. She decided to celebrate minor holidays with festive breakfasts, and make the family happier by emailing anecdotes and cute pictures of the girls, including young Eleanor’s first loose tooth. 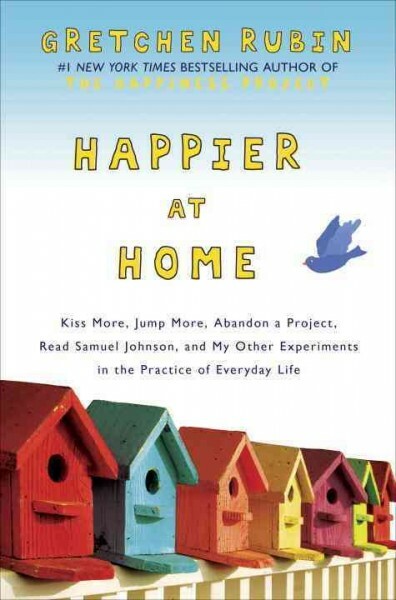 I suggest starting with her first book, The Happiness Project, but I enjoyed another visit with Gretchen and more ideas to make home a happy, peaceful place. Read more at the author’s website. I saw somewhere that a lot more people are texting more and calling less, also that people are getting fed up with voice mail (“your call is important to us” – yeah, right!) and using it less too. Maybe if she moved out of NYC she wouldn’t dread driving as much though. Somehow I don’t think more driving equals more happiness. I could use some help decluttering though. I bet that would make her day! I also see from the cover she likes Samuel Johnson. I wonder how many people would have bought a boat or joined the Navy if they knew he said a ship is a jail with a chance to drown? Perhaps some unhappiness could have been averted.